They say when it rains it pours- and it has been pouring cool beetles for me this month. 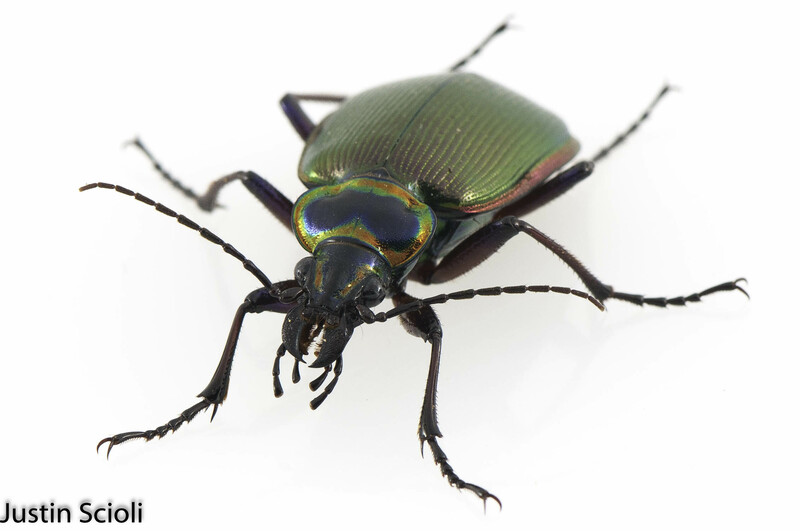 I am someone who is instinctively attracted to iridescent things, and the iridescent exoskeletons of many insects, such as Buprestid beetles and Calliphorid blowflies, have always fascinated me. 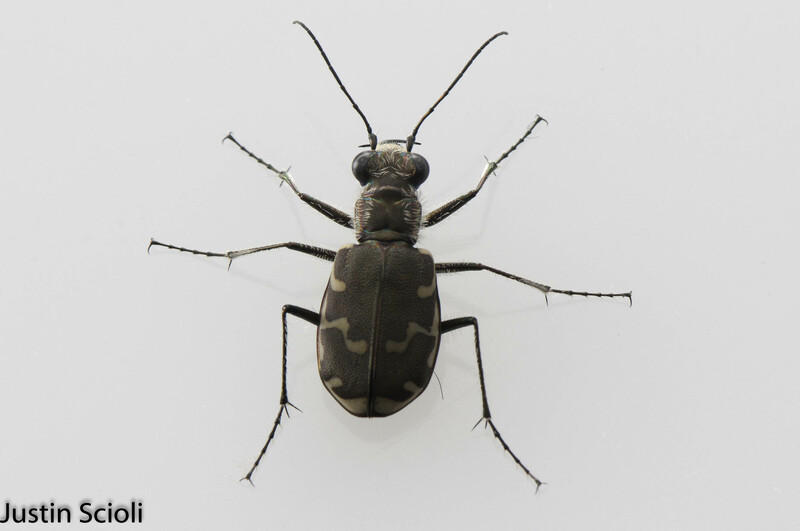 The first example is perhaps the least flashy; this bronzed tiger beetle (Cicindela repanda) was found in Kisatchie National Forest on the banks of the creek in which I found the crayfish I wrote about last time. They were very numerous and active, scurrying rapidly through the sand and flying small distances in spurts. While the elytra are a drab brown with tan markings (which are diagnostic), the ventral side of the animal as well as surfaces on the legs, head and thorax are a bright, shining green. 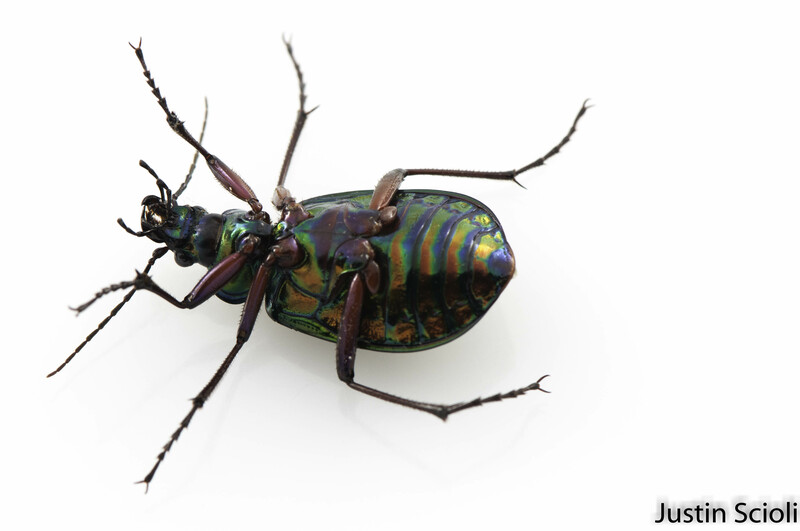 Iridescence in insects is the result of a complex of layers in the exoskeleton that reflect and absorb different wavelengths of light, and the interaction in light being absorbed and reflected in the different layers leads to unique and varying patterns. The colors reflected are therefore due to the structure of the cuticle and not due to pigments, meaning the colors we see are “structural,” a phenomenon also seen in peacock feathers. 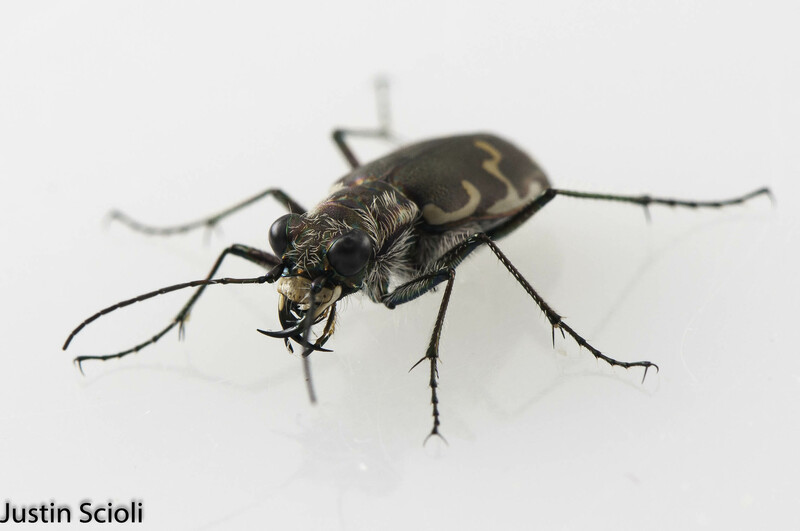 This biophysical adaptation is thought to be potentially advantageous as it reflects the wavelengths of the surroundings, making the insect less detectable. Another example was found just steps from the door of my apartment. The fiery searcher (Calosoma scrutator) is a predatory Carabid beetle that feeds on caterpillars, a habit that gives the genus Calosoma the common name “caterpillar hunters.” This species ranges widely though North America, and having seen Alex Wild’s excellent photo of one years ago, it was something certainly on my bucket list. My hopes were galvanized by finding a dead one beneath a parking lot light a few months ago. Photographing this specimen was one of the most enjoyable photography experiences I have had in a while. Although it was very active and jittery, the way that light bounced off it’s various surfaces lead to lots of different color combinations that you just don’t appreciate when you are looking at this animal in situ in a typical habitat. 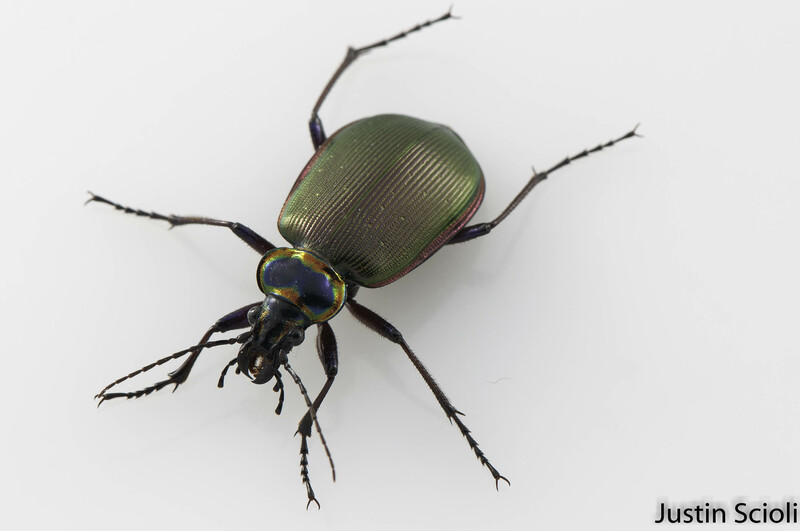 Interestingly, the iridescent outer cuticle of some beetles have been used in biomimetics to make artificial compounds that have similar visual effects. The manufacturing corportation 3M has created a plastic compound, called radiant light film, which functions in a similar way and has been used in various plastic products. 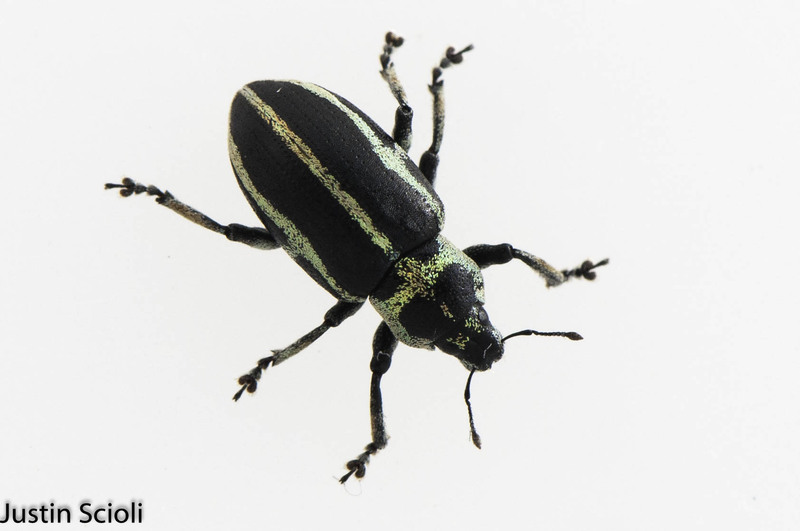 The last, and most unusual of the bunch in my opinion, is this cool little Sesbania clown weevil (Eudiagogus pulcher) that I found (unsurprisingly) on a Sesbania plant in Palmetto Island state park. Unlike the others, the iridescence is not generated in the exoskeleton itself in this case, but by outer scales that line the body tagma in a unique pattern. 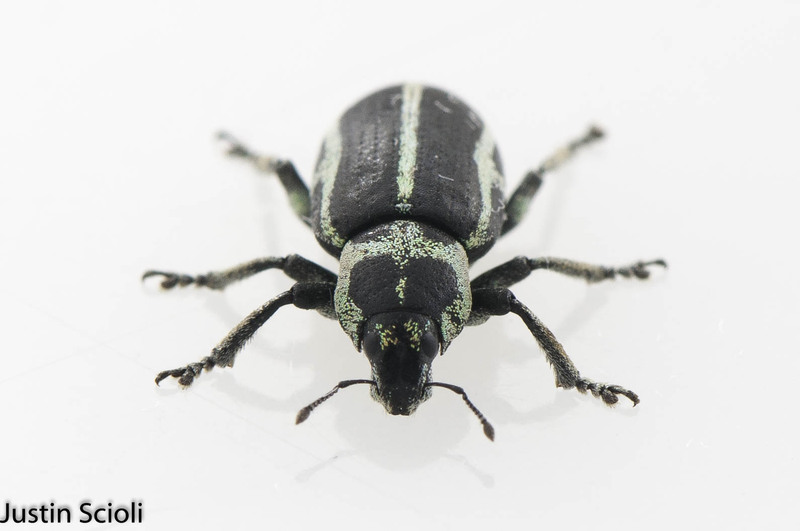 Photonic crystals have been discovered in weevil scales, an evolutionary novelty that is thought to facilitate intersexual recognition and better reflect backgrounds and therefore hide the weevil. 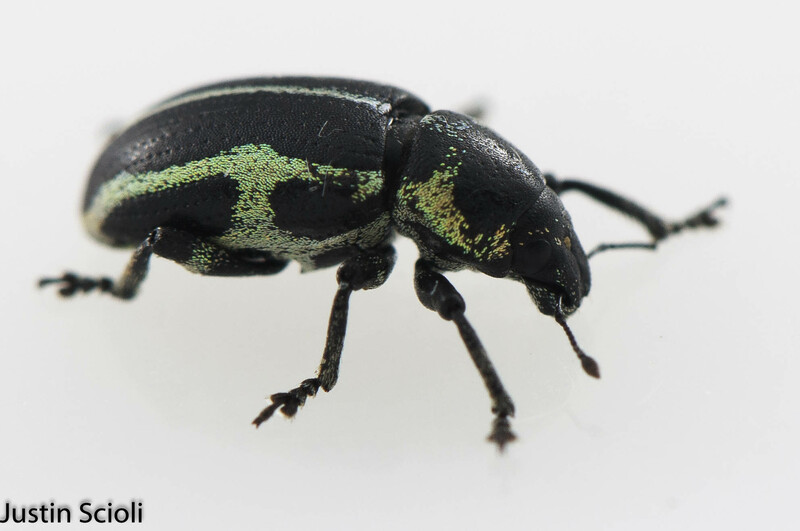 While I am a far cry from being an expert on biomimetics, I certainly learned a lot by poking around online after finding these beetles on recent adventures. It does make me curious as to what the world’s engineers will continue to develop when they have such great innovations to copy.